That is where I came across the lovely Georgia Hecht. Super nice, like someone you would want to have lunch with, nice. Georgia creates fabulous jewelry from parts and pieces of old jewelry, metals and watches. 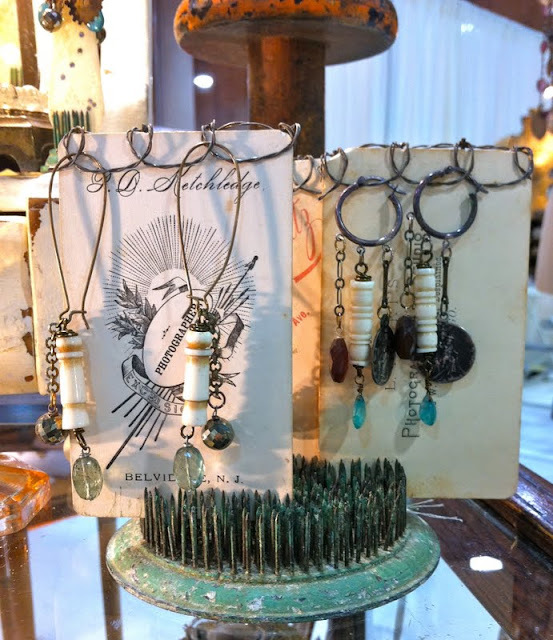 I will say her displays caught my eye (ever so clever) and the jewelry, well that was what kept me in the booth for more than 30 minutes (and it was a small booth!). 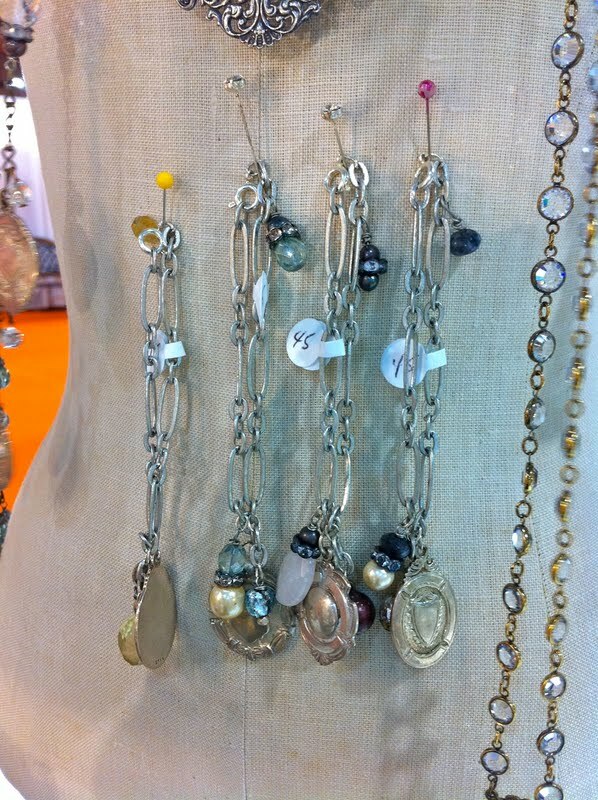 So many pieces to see and try on. Everything was eye candy. I better thrown in a disclaimer here...all my photos were taken with my iphone and they do not do the jewelry justice. This was a long necklace made from a vintage pill case or compact (it was about 1/2" thick). 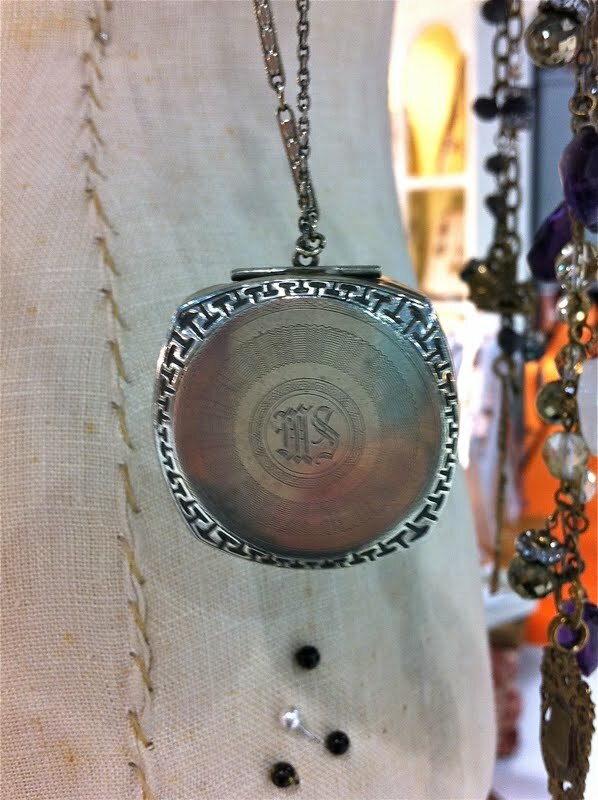 It would be a lovely gift for someone with the initials MS since they were engraved on the front. 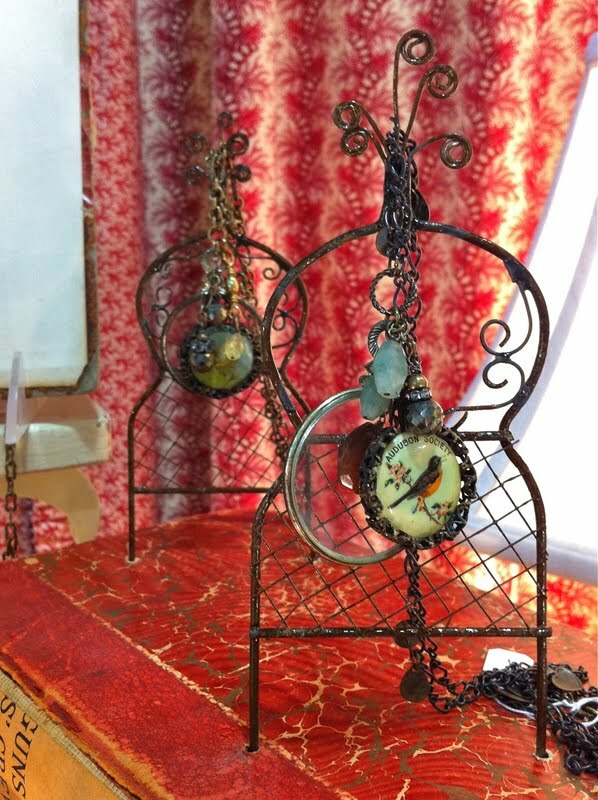 Since Deb and I do the displays for the 7gypsies booth I am always intrigued by how other people display items. 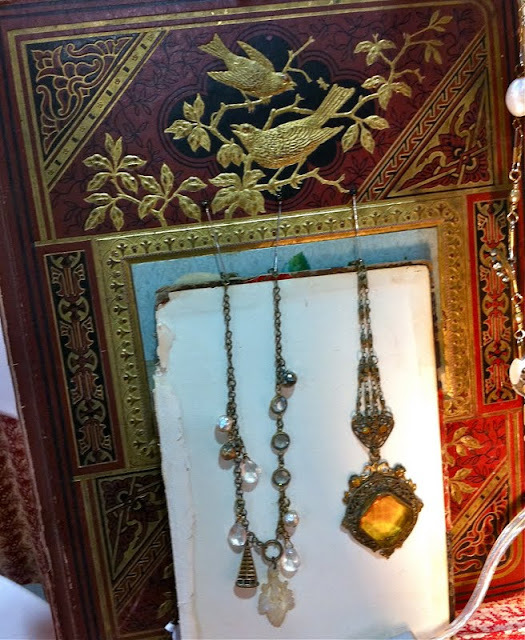 Georgia used books like this fabulous old cover with gold birds. So beautiful, it really could be hanging on a wall as art. 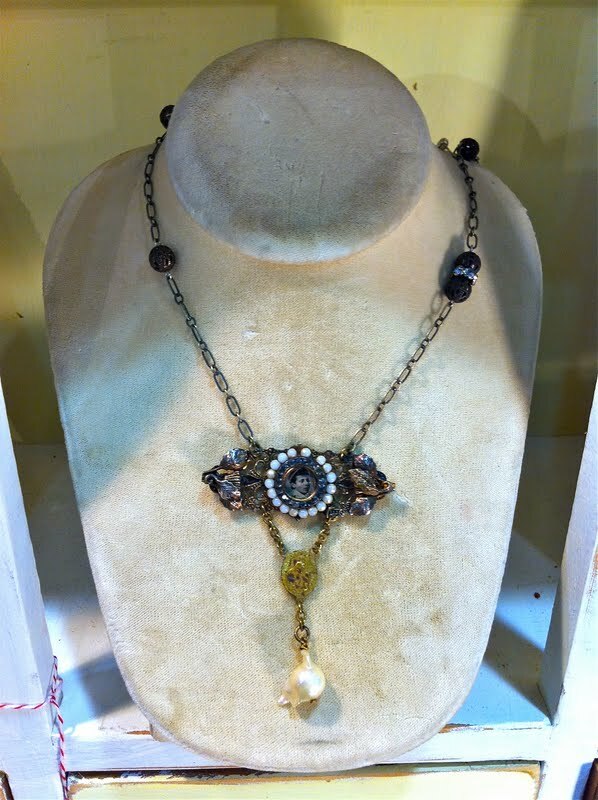 This necklace was one of my favorite. It was a long necklace with about 5 or 6 hanging charms including a optical lens and a darling vintage bird button. 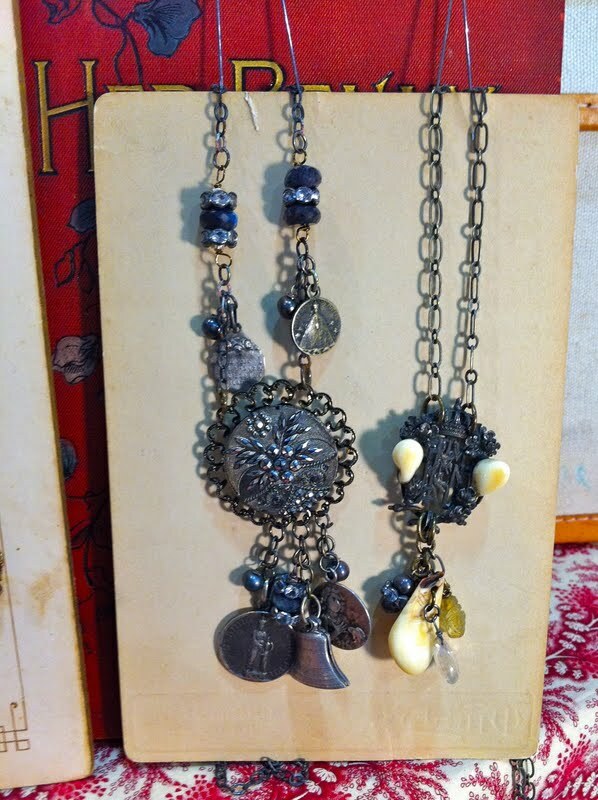 Long necklaces made from vintage buttons and jewelry parts. Loved the necklace with the round locket with the wishbone on it. 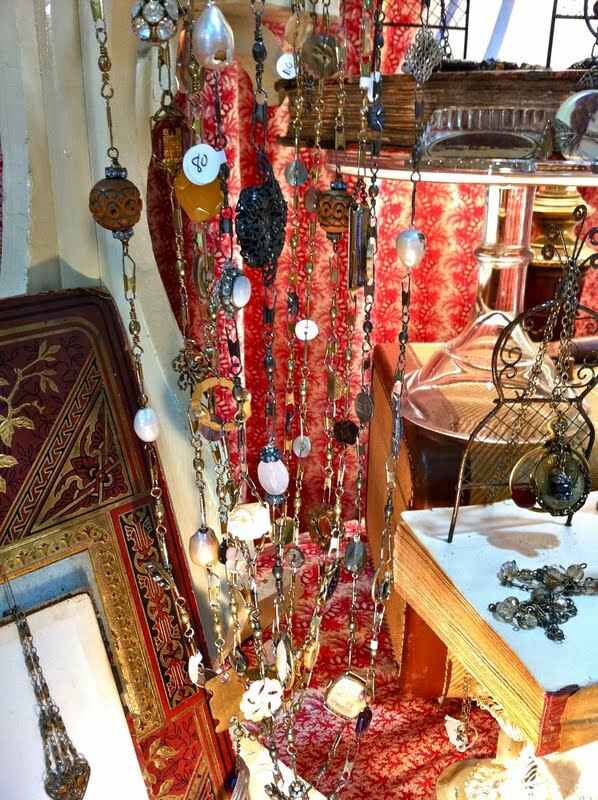 A long necklace with a little hanging case. The case is engraved with the initials JRD and is held closed with a little pencil. When you take the pencil out, the case snaps open to reveal a compartment for paper which I think I will use for pictures. On the back it is engraved with the date 1917, almost 100 years old! The second piece is a bracelet made from a vintage shoe buckle. At present, Georgia doesn't sell online but you can find her at these two Southern California events which might be fun to visit if you are in the area. 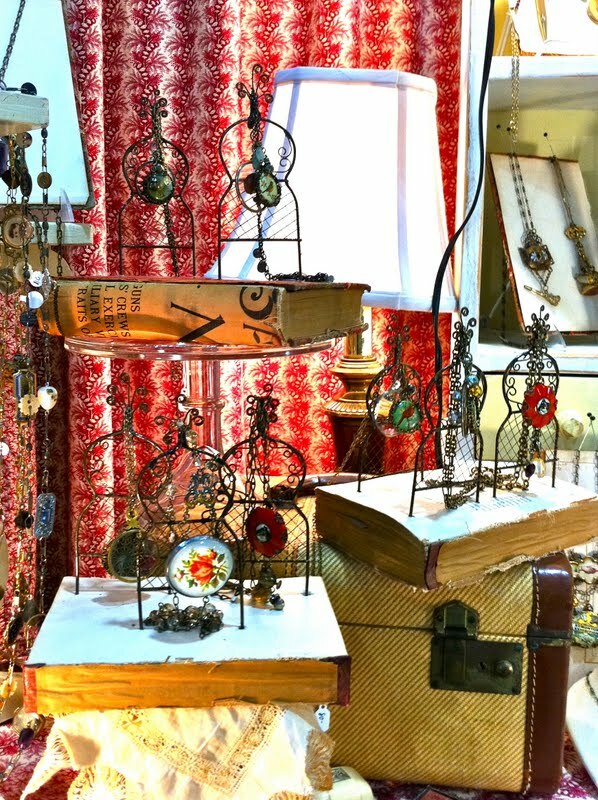 I have never been to either of these shows but the pictures online look like a great mix of handmade items which I always love. 50+ vendors selling all forms of mixed media from handmade jewelry, dolls, paper crafts. You Tube video showing the 2011 Spring show mix of vendors. 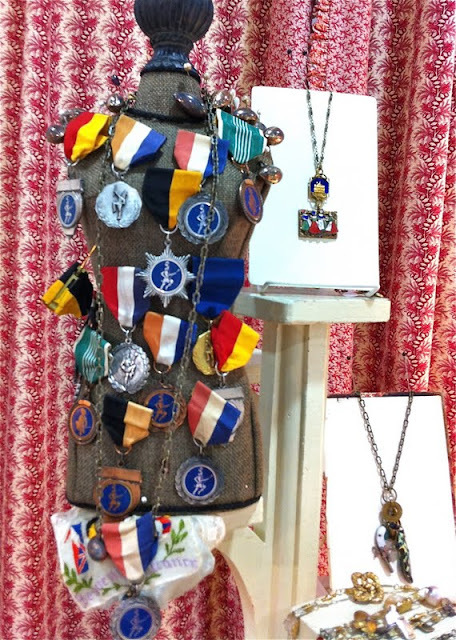 And if you are interested in any of the pieces shown in this post. Just email me and I will send you Georgia's email address. 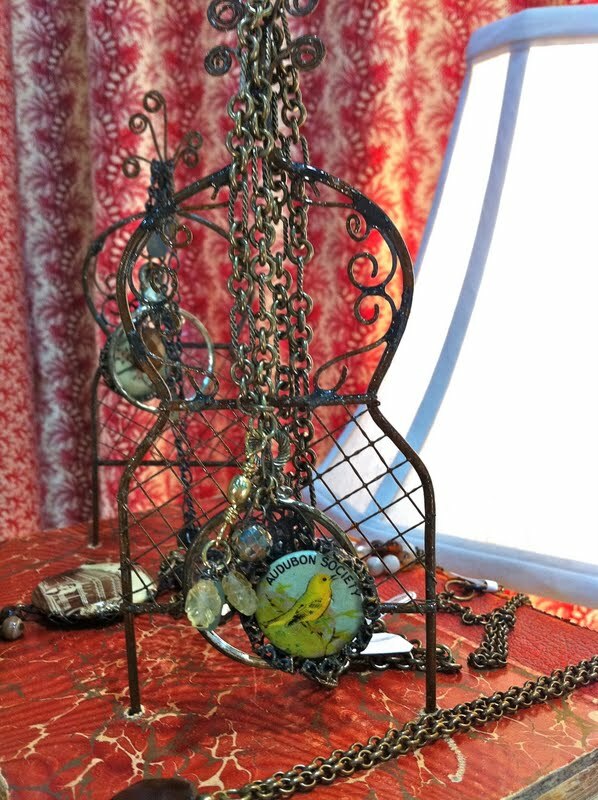 Please know that since these photos were taken at an event some of the jewelry shown may have already found a home. 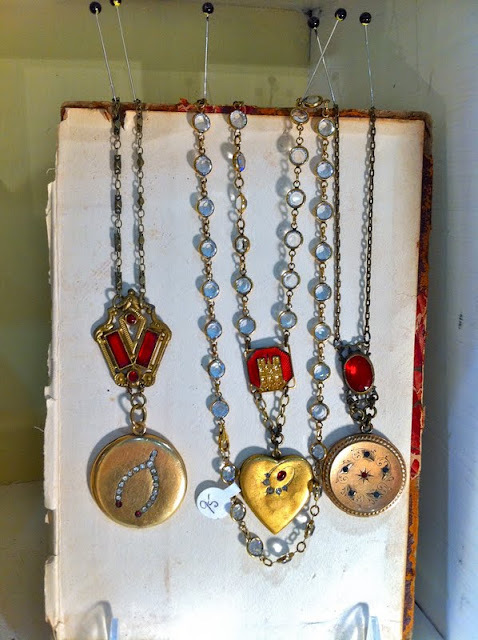 Gorgeous jewelry - so different! 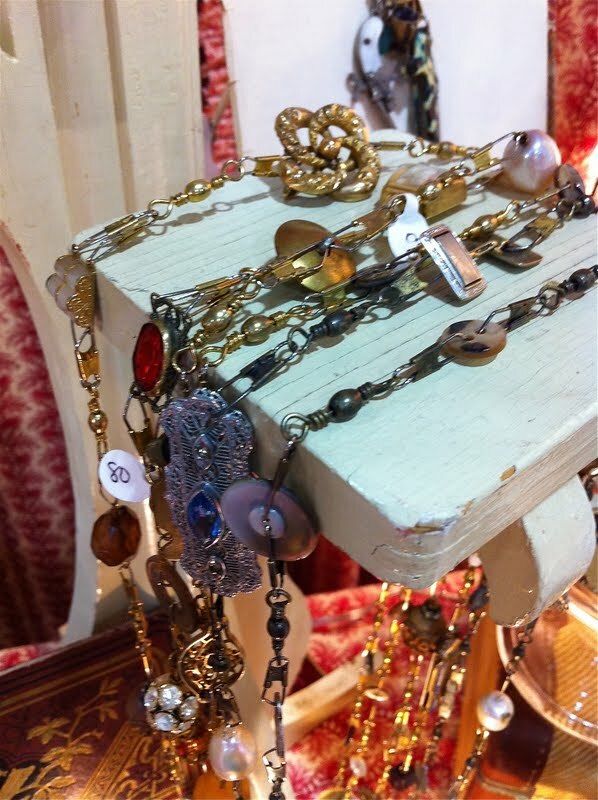 I love your necklace and bracelet - good picks! I so enjoyed strolling through your post! 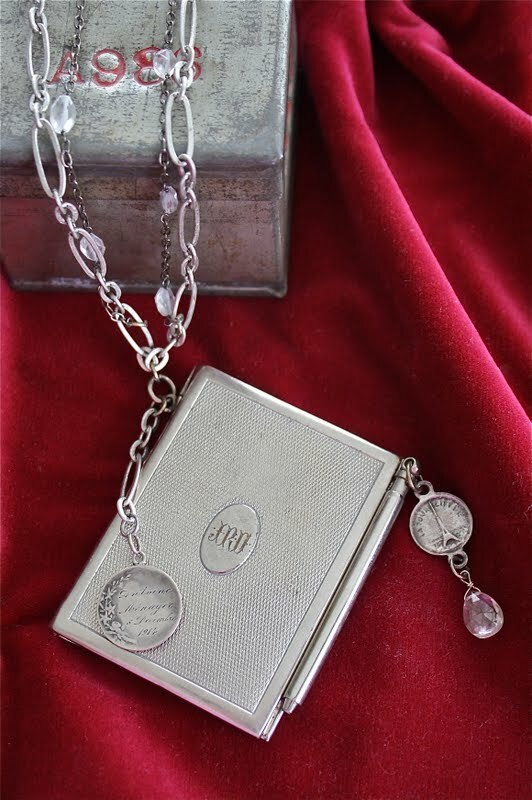 The necklace with the silver compact with pencil was used by young girls to hold their dance cards, so I believe. Before the dance began, young men would ask the girls for a certain dance which was numbered. The girl would then write the fellows name beside that number.